This week I met with the founder and CEO of VRHealth, Eran Orr, to take a look at this ground breaking VRHealth telehealth-VR platform. 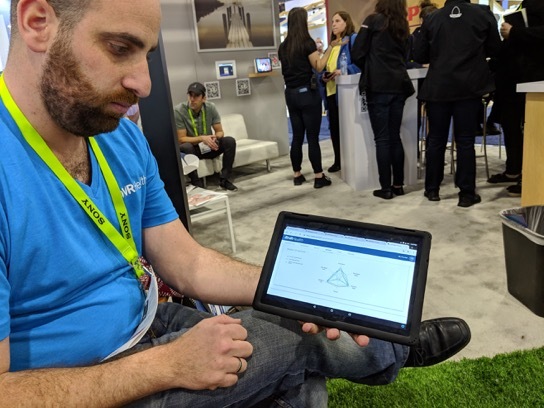 We met at the AARP Innovation Lab booth located within the vastly growing healthcare section of the 2019 Consumer Electronics Show. 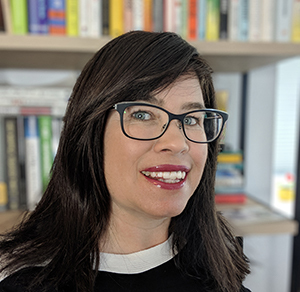 Also read our interview with Sarah Hill of StoryUP featuring the Healium XR platform for mental health. 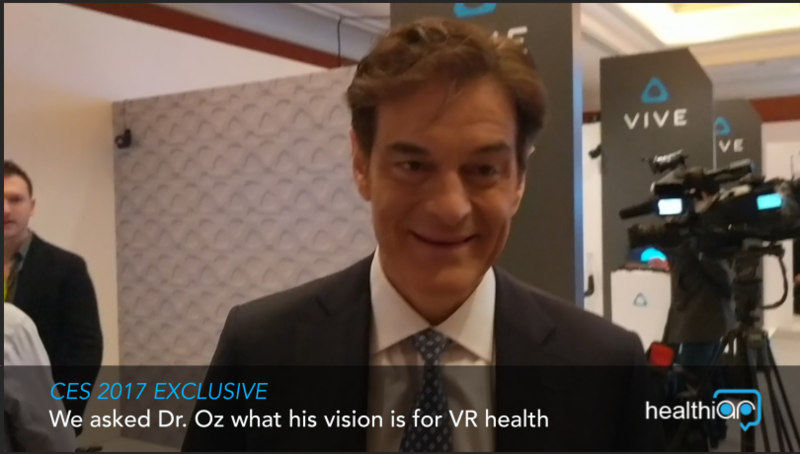 It was here at CES 2019 that VRHealth launched it’s telehealth-VR platform. VRHealth is not just a typical healthcare + virtual reality application, it’s a combination of immersive virtual reality healthcare activities and health data capture. 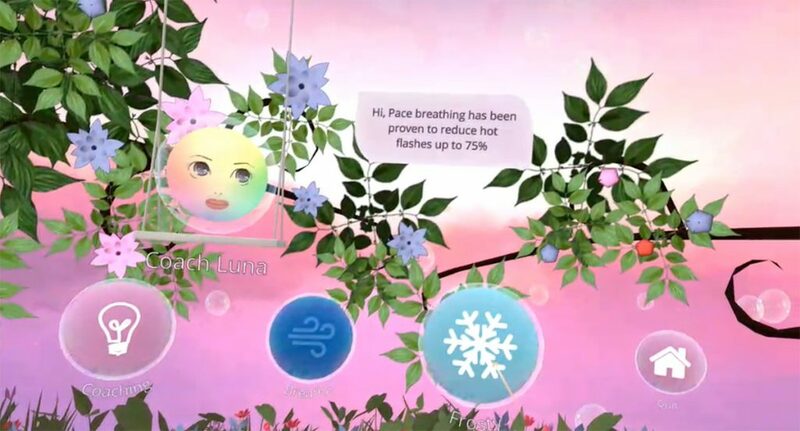 As a user interacts with the content such as games that assess and train cognitive skills, activities that mitigate hot flashes, and meditation for providing pain relief, health data is captured to provide real-time feedback to clinicians, caregivers and the patients themselves. This allows for ongoing monitoring and management of health conditions over time. The serenity of the animated landscape allowed my brain to adjust to the stimuli and I started to physically feel cooler. I followed the instructions to yawn and manage my breathing. The whole experience was easy and intuitive. After, Eran was able to show me a bit about what health data was captured which is accessed via a patient data web portal. Readers of healthiAR.com know that there have been other companies that have attempted to reduce pain or heat sensation through visual stimuli and virtual reality. 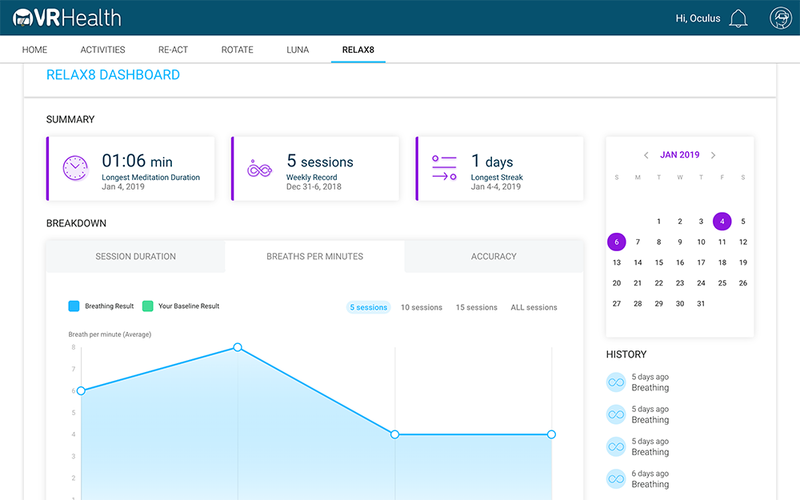 But VRHealth is the first to add the artificial intelligent therapist as a guide and, more importantly, the health data reporting feature. They are also the first to be registered with the FDA for such use. VRHealth has made a name for itself as a revolutionary medical device company that uses analytics and virtual reality to improve patient experiences. VRHealth’s Eran Orr explained to me that they are the first certified virtual reality medical company in the world and all its medical applications are FDA registered. Their mission is to provide clinically relevant virtual reality healthcare products that focus on motor cognitive, physical, psychological, postural ability and pain assessment and treatment. VRHealth’s new application recognizes the benefits of telehealth by allowing patients control over their health data and who it is shared with. Patients can grant data access to their family members, caregivers, and physicians, allowing them to become active participants in medical decisions. 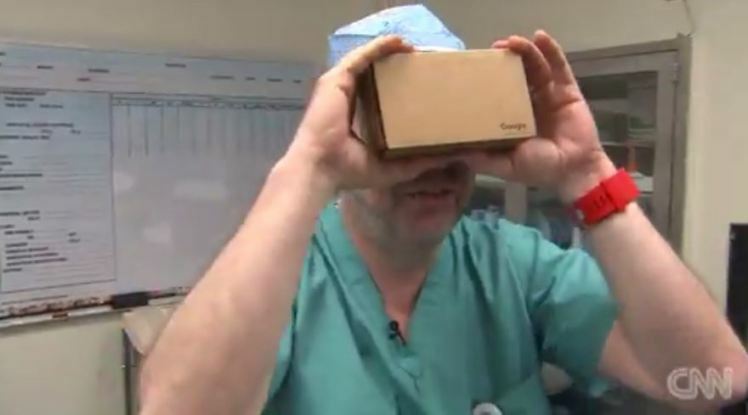 Our VRHealth telehealth-VR platform is a crucial step in the healthcare process because it enables patients to engage in a healthcare routine in the comfort of their own home while providing access to their health data directly to their doctors. 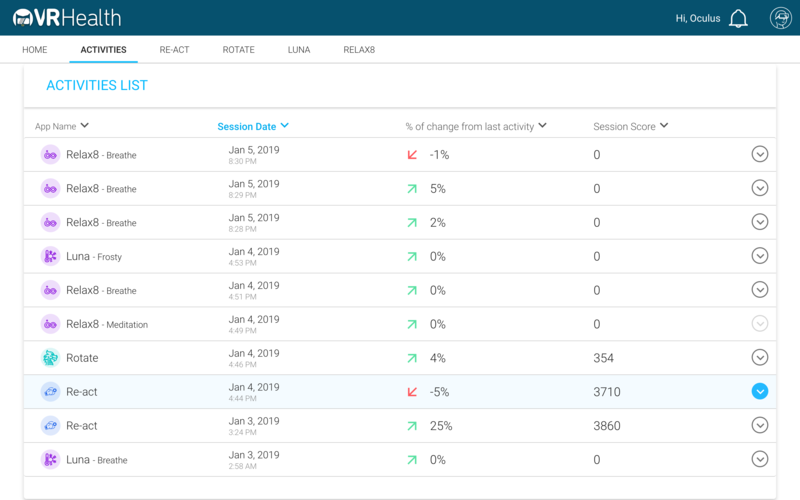 Any adjustments that need to be made to a patient healthcare regime can be adjusted based on the data in the platform. AARP has a long history as a driving force behind products that are focused on the healthcare needs of today’s aging society, namely those over the age of 50. Since 2015, AARP has been working with startups via their Innovation Lab program. AARP Innovation Labs allows startups to collaborate with AARP to create solutions that improve the health and lives of aging citizens. 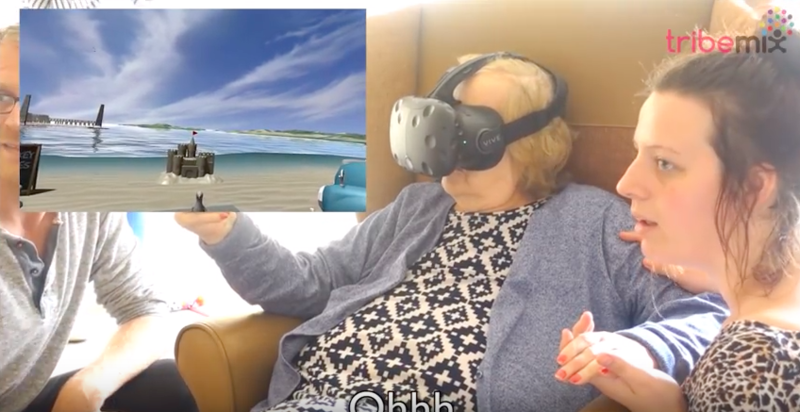 As a resident at AARP Innovation Lab, VRHealth and Eran Orr was able to bring their virtual reality-based telehealth solution to the “Health and Wellness” section of Alcove VR, a virtual reality application that connects families from different generations and socioeconomic backgrounds inside an immersive experience in the virtual world regardless of location. In addition to remote health monitoring and real time health data, VRHealth’s platform will continue to expand its immersive health virtual reality environment including brain health applications, memory span and cognitive skills, neck exercises, and pain management techniques. For those who don’t have access to Alcove VR, the VRHealth’s health platform is also available through the Oculus store. For more information about VRHealth and its products, visit their website: https://www.xr.health/. Kristi is the founder of healthiAR and is an expert on the impact immersive technology is having on healthcare. Visit her at getkristi.com.